MAMA MUSE is a new genre of cool, coveted maternity wear with a contemporary twist- designed to be worn during and after pregnancy. Each of the designs are ultra-flattering, considered and not make you want to toss everything the minute your water breaks. The MAMA MUSE philosophy is centered around thoughtful design and quality construction while offering fashion forward, comfortable and functional pieces designed to make you glow. 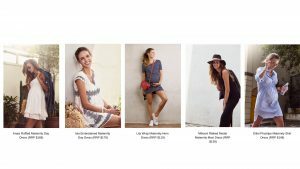 Whether you are after the perfect compression cami, multi-tasking LBD or statement tee – MAMA MUSE provides a range of classic dresses, tops and tees, nursing intimates, and swimwear making it effortless for expecting and nursing mums to inject contemporary street style into their wardrobe. Stephanie Bailey, Creative Director and CEO has always had big aspirations but by balancing that spirit with a lifetime of entrepreneurial attitude and hard graft, she has been able to turn her imaginings into a successful reality. As a busy mother of three, for years Stephanie had struggled to find well-constructed maternity basics that reflected her own sense of style and, in 2015 when pregnant with her third child, Louis, started laying the foundations for a collection that delivered the perfect blend of ‘comfort with the cool factor’ that would allow new mums to get more mileage out of their maternity wardrobe. Simplify your maternity-style approach with MAMA MUSE’s signature pieces including: the Anais Ruffled Maternity Day Dress, (RRP $169) a flouncy, ruffle-trimmed dress crafted from two layers of smooth stretch cotton, featuring a smocked bust and delicately elasticised shoulder straps that can be detached easily for fuss-free nursing access. The office-appropriate Elliot Pinstripe Maternity Shirt Dress (RRP $149) is cut from fine blue and white striped 100% cotton poplin with delicate under-bust shirring that works to flatter a growing bump, whilst mother-of-pearl snap closures line the placket empowering new mums to breastfeed with confidence. The Isla Embroidered Maternity Day Dress (RRP $179) is cut from two layers of airy 100% cotton voile, decorated with embroidery accents, trimmed with swishy tassels at the back, and features the mama must-have, deep side pockets. Its delicate pleats under the bust create a soft billowy silhouette. Make a statement with MAMA MUSE’s asymmetrical LBD, the India Maternity T-Shirt Dress (RRP $119) or the best-selling Millicent Ribbed Modal Maternity Maxi Dress (RRP $139). Discreet nursing access is a breeze with its hidden inner bust layer and flattering deep scooped neckline. MAMA MUSE’s Allegra Brushed Premium Jersey Maternity Leggings (RRP $109) is made from supportive, stretchy fabric with a butter-soft outer texture. Its soft, oversized waistband lies flat against your bump and offers light compression that helps to sculpt the body – with flexibility to be worn either over or under your bump. MAMA MUSE’s leg-lengthening Dillon Ankle Zip Maternity joggers ($119) have a detailed ribbed, elasticated waistband and cuff- made from a dense, flexible cotton blend that’s strategically panelled with blush stripes and detailed with ankle zips and trims. Comfort Reigns Supreme with MAMA MUSE’s luxe basics including: the Annabel Asymmetrical Nursing Top (RRP $79) which is made from a smooth, breathable bamboo blend and drapes beautifully over the bump. Announce your pregnancy in style with the BÉBÉ À BORD Graphic Maternity Tee (RRP $69) it’s slightly over-sized and cut from a premium, stretch-cotton blend with a crew neck boyfriend-style fit and rolled sleeves. The innovative Lily Terry-Lined Nursing Compression Cami (RRP $79) is a first of its kind and your new nursing wardrobe wonder! With a fully supportive inner shelf bra which is lined with soft, seamless terry fleece to absorb moisture and conceal minor leakage. The stretch-mesh lining throughout the bodice offers light to medium compression to smooth the silhouette and encourage skin retraction postpartum. The Liberty Deep V Maternity Tee provides an ultra-flattering design from smooth, super stretchy jersey with a high-quality feel and finish. Alternatively, The Cameron Long Sleeved Striped Nursing Top (RRP $89) is cut from soft blended modal with a double-layered, super-stretchy deep scoop neckline which simply pulls down for discreet nursing. Many of the designs go beyond traditional simple ruching and feature concealed inner bust layers, flexible nursing-friendly necklines, soft shirring, delicate pleats, deep pockets, zip details and double-layered fabric to smooth the silhouette. MAMA MUSE has quickly become synonymous with quality and thoughtful design, offering women a departure from traditional maternity and nursing wear. Innovative, independent and Australian-owned, this is a brand that cares about women and since launching, has proudly supported mothers2mothers and their efforts to eliminate paediatric AIDS in sub-Saharan Africa. With its pared-back colour palette and looks that are the antithesis of ‘mumsy’, MAMA MUSE is fast becoming the go-to brand for new and expecting mums looking to embrace the modern mama cool movement.